Well this is my 3rd week of blogging. 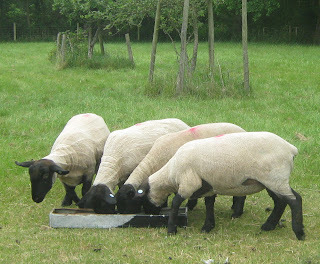 Last week I told you about the Suffolk Sheep Society so this week I am going to tell you about Showing Sheep. But first let me tell you about my sheep. They are looking well at the moment so we are going to cut down feeding from three days a week to two days. It will be a week or two until the Gimmers get the grass well eaten and we can move them on to the Camp Fire Field. It is important that we do not get the Gimmers too fat, so I will keep an eye on them. Always wear a clean white Coat to go into the ring. Next week I will tell you what to look out for in a good Suffolk Sheep.